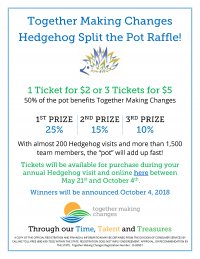 Together Making Changes Hedgehog Split the Pot Raffle! Deadline for purchasing tickets is October 4, 2018. Tickets will be on sale to TMC team members during our Hedgehog Council’s annual meetings. Our Hedgehog Council is holding a Split the Pot Raffle to raise money for Together Making Changes. Tickets are on sale for $2 each or 3 for $5 and can be purchased online here or from any member of our Hedgehog Council during TMC’s annual Hedgehog visits to their facilities. Resolve to be tender with the young, compassionate with the aged, sympathetic with the striving, and tolerant with the weak... Because in your life you will have been all of these.